Personalised service, a commitment to industry and flexible delivery options are paying big dividends for vocational child care training in Alice Springs. The efforts of Heather Wilson, VTE childcare lecturer and Sharon Spencer, education support lecturer have seen nearly 50 new student enrolments covering Alice Springs (40), Tennant Creek (7) and Yulara (2). Child care and early childhood education share core subjects and have merged classes. Heather and Sharon admit the merging of their classes this year increased numbers, along with the need for child care staff to become qualified, but their efforts in engaging industry and students, building flexible coursework around their needs and providing face to face service has increased student numbers. ‘Our very first step was seeking industry input,’ said Heather Wilson. After approaching child care directors and fielding their ideas, Heather and Sharon invited them, along with students, to an information evening where priorities and aims were discussed. ‘It was clear centres and students wanted weekend and evening classes and an ability for flexible classes and the ability for on-site assessment,’ said Heather. Weekend classes were created allowing students to complete studies outside working hours. Tutorial support was also created allowing students to gain help Thursday evenings, with workplace assessment now an option. It’s this approach that helps the lecturers secure new students. After visiting Tennant Creek seven people were enrolled. 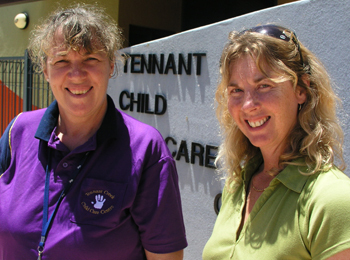 Tennant Creek centre manager Rhonda Murphy said face-to-face presence is critical. The centre, like many, is keen to provide accreditation to existing staff. One way is through the apprenticeship system. Wilson has now sent apprenticeship packs to all child care directors. Students are often reluctant to take on apprenticeships but realise the 12 month time frame is short and provides more benefits. Sharon and Heather have also developed a student study calendar providing students with flexible learning options and the ability to plan their studies through the year. ‘For the younger students, it’s also about making them more proactive and independent in their own learning,’ said Heather.